This is it, Dr. Udell’s primary office. I want to treat patients for years and years to come, but I don’t want to move any more (got a many year lease). I originally envisioned The Child Development Center of America as a central facility for parents to get answers and therapies. As we have grown, the practice has assumed situations with increasing responsibilities. There are so many disciplines required to achieve an optimal outcome that it seemed that parents would seek such a service and providers would wish to participate. The reality of the autism spectrum epidemic is that there are so many moving parts required that the various goods and services really can’t exist in any one place. My colleagues around the country seem to be experiencing a similar situation. Some ‘DAN!’ practices combine general pediatric services (adult treatment, even), usually requiring the support of health insurance personnel. Universities and their associated clinics such as The MIND Institute generate a great deal of research. Other practitioners take on therapies requiring added responsibilities such as OSHA or other regulatory agency’s oversight and approval. Some practitioners teach and leave well-trained staff to experience more participation in patient care. ABA, OT, PT, S&L and the myriad of therapies that aid improved outcomes tend to be local, even in people’s houses, and take time. Alternative protocols take time and resources. For most families, there is also homework to get through and school projects, etc. At this time, the multidisciplinary village that attends to developmentally challenged children is the iPhone scheduling system of diligent moms and dads; even if they are separated, as are the great majority of ASD families. The Child Development Center has settled into a really comfortable, brand new office in Davie, FL (think Bergeron Rodeo), with friendly neighbors and easy highway access. The same fish tank, toys and toy box. Even more cameras and flat screens. There’s an even better railroad station playroom for the kids and a new computer station. (Parents, please tell us when you don’t want the children exposed to Wii or TV, and we will hide those amenities). In such a comfortable setting, we get to observe the patients enjoy the experience and be as much like their normal selves as possible. 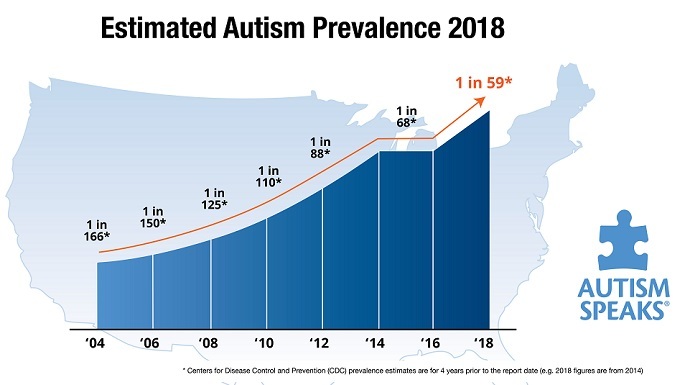 The medical conditions falling under the autism diagnosis now affect more than 2% of infants, children, adolescents and adults. The disorder is nearly a complete mystery. Is it genetic, or the environment? Or both? Is it really even an epidemic? Presently, there are so few doctors who choose to study in this specialty. The pediatricians, neurologists, psychiatrists, allergists, gastroenterologists, dermatologists, immunologists, geneticists, and epidemiologists agree on very little. Parents turn to treatments with less scientific testing or validity and unknown risks. My purpose has become more simple. Autism spectrum disorder is a combination of signs and symptoms that, if recognized early and properly treated by appropriately trained medical personnel, is amenable to effective treatments that are available today. Physicians can be an important part of the team that helps recover form and function. The Child Development Center hopes to serve as a model to help other doctors assume ASD care. In a previous story, I took great pride writing about my beautiful office and friendly staff. That has not changed. Only the location – we’re just down the street. This entry was posted on Sunday, April 21st, 2013 at 1:25 pm	and is filed under >ALL<, AD/HD, Alternative and Complementary Medicine for ASD, Asperger's Syndrome, Autism Therapies, Patient experiences, Reversing autism, Special Therapies, Speech and Language. You can follow any responses to this entry through the RSS 2.0 feed. You can leave a response, or trackback from your own site.